A visualization of the inner workings of how a lock is opened by a key, shown through a cross section of the key entering the lock. Possibly having text floating to accompany the visual. 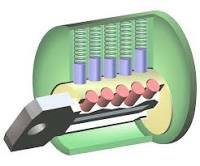 To use a cross section of a lock and key working together in order to help people understand the inner workings of a pin tumbler lock. Anyone interested in knowing the inner workings of a lock, so primarily people of age 16 and up, though it should be simple enough for the younger audience as well.